This expandable, 6-arm gourd rack system comes with a hub designed to accept 6 additional arms on a lower tier in the future should your desire or conditions warrant it. 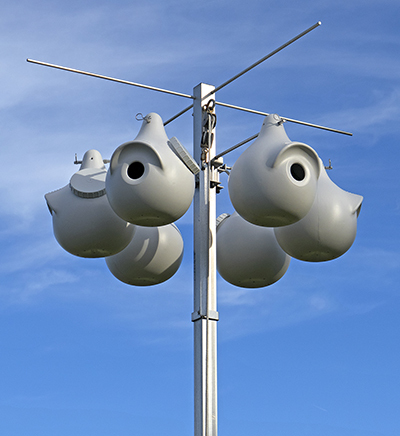 The 2-inch-square pole is 14 feet high when installed and is made of high-tensile-strength aluminum. The hub raises and lowers without turning while doing nest checks and slides silently up and down due to nylon glide buttons on the inside. The six 3/8" round aluminum horizontal gourd arms can lift off the hub for easy nest checking, or pull the hitch pins to easily remove the gourds. Includes 45 feet of long-lasting, polyester rope. Rack ships with a two-piece, 14-foot pole, heavy-duty ground stake, top perch rods, 6 aluminum horizontal gourd arms (for gourds drilled front to back), hitch pins, rope winder, and a hub with attached rope, eyebolt, and pulley. Comes with 6 gourds of your choice. Easy assembly.